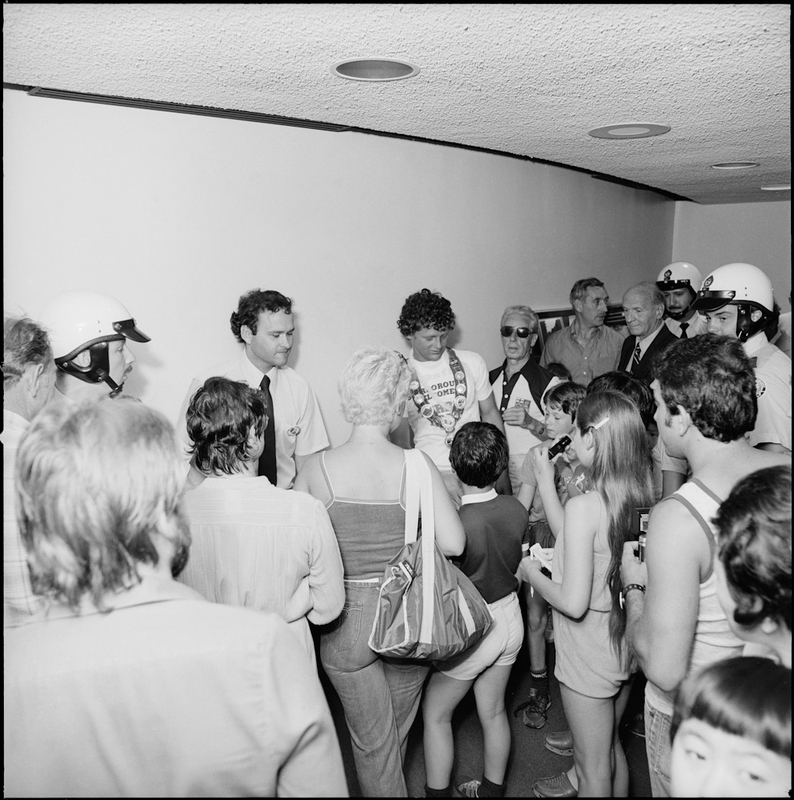 Terry Fox was born in Winnipeg, Manitoba on July 28, 1958. 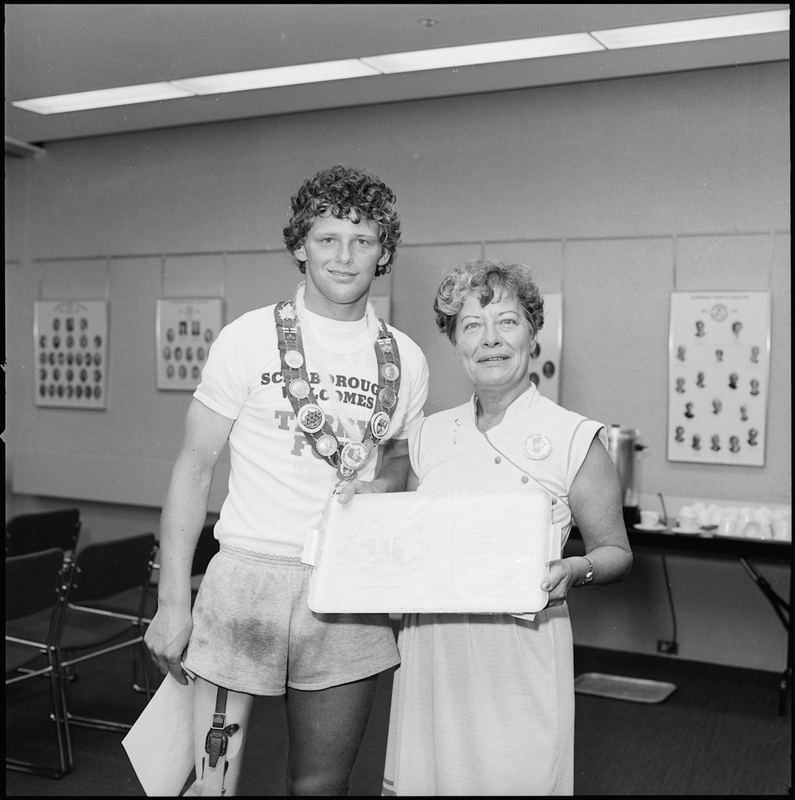 He grew up in Port Coquitlam, British Columbia and was an athletic teenager, participating in both long distance running and basketball at high school and university. 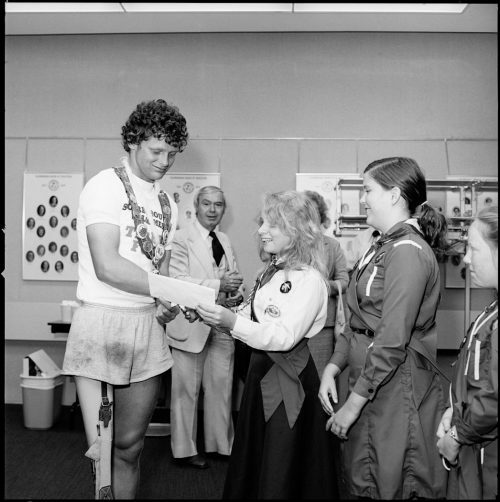 In 1977, Terry was diagnosed with osteosarcoma, a bone cancer that led to the amputation of his right leg. Despite this hardship, Terry had a very positive outlook, and three weeks after the amputation, he was walking with an artificial leg. Terry endured sixteen months of chemotherapy, and during his treatments, he became interested in supporting cancer research. 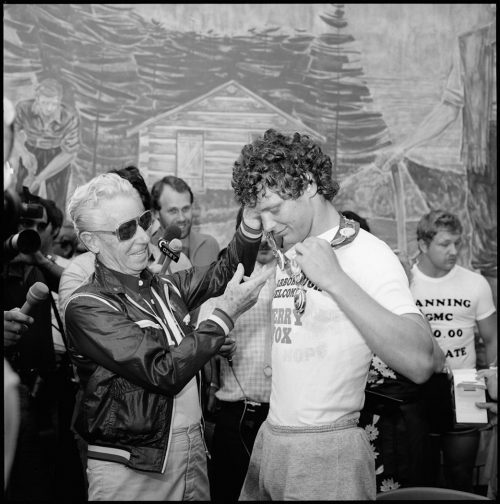 He was inspired to take up long distance running again, and completed his first post-surgery marathon in 1979. 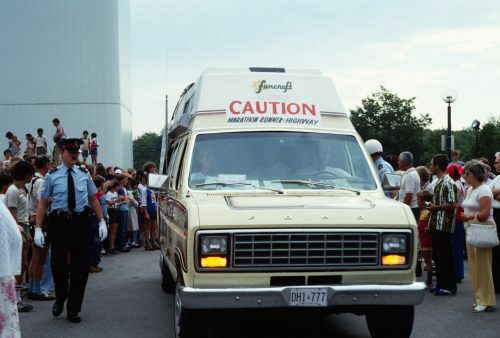 He began to formulate a plan to run across Canada to raise money for cancer research; his goal was to raise $1 for each of Canada’s 24 million people. Terry Fox began his Marathon of Hope on April 12, 1980 at St. John’s, Newfoundland. Initially, Fox was disheartened. He felt that support for his cause was lacking and contributions were disappointing. Things began to change however once he reached Ontario. 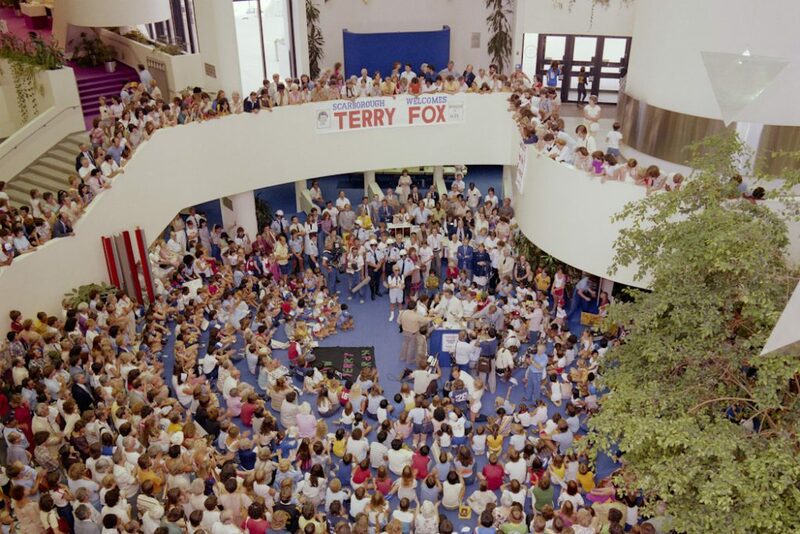 His fame was growing and the Canadian Cancer Society arranged many functions where Terry delivered inspirational speeches. 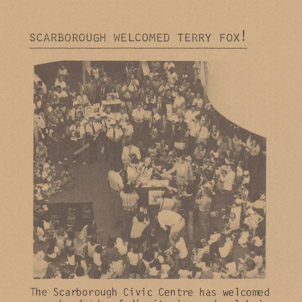 Initially, Scarborough staff were concerned there wouldn’t be a crowd to greet Terry, but they couldn’t have been more wrong. The crowd filled the central space and jammed the surrounding balconies of the Civic Centre with an outpouring of community support. Terry was appointed Honorary Mayor of Scarborough for the day, and the City of Scarborough pledged a $5,000 contribution. 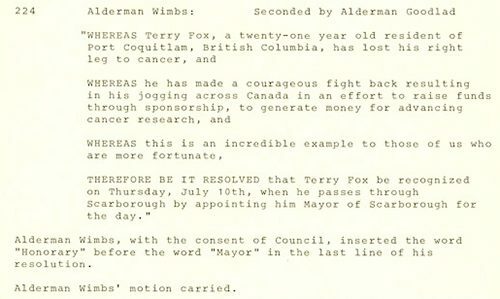 In addition, Helen Campbell, widow of Scarborough’s first Mayor, Albert Campbell, presented Terry with a cheque from the Scarborough Unit of the Canadian Cancer Society. Terry was also presented with a commemorative tray by Alderman Shirley Eidt. 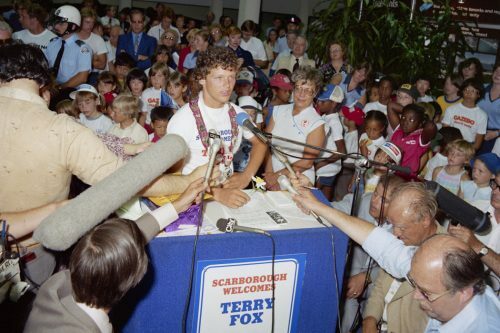 Terry also stopped to sign autographs with children before leaving the Scarborough Civic Centre. After leaving Toronto, he continued on his journey. However, by August he was completely exhausted and was forced to abandon his marathon just outside of Thunder Bay. His cancer had spread to his lungs and he could no longer continue. 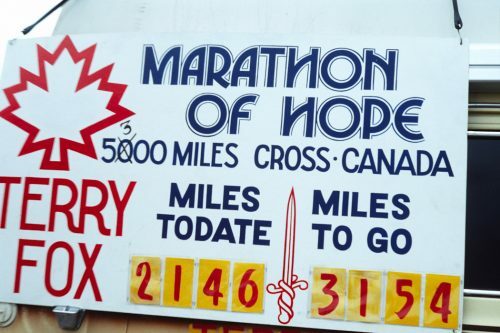 After 143 days, Terry had run 5,373 kilometres and raised $1.7 million. In the following months, he continued to receive various treatments, but his cancer continued to spread and he died on June 28, 1981. 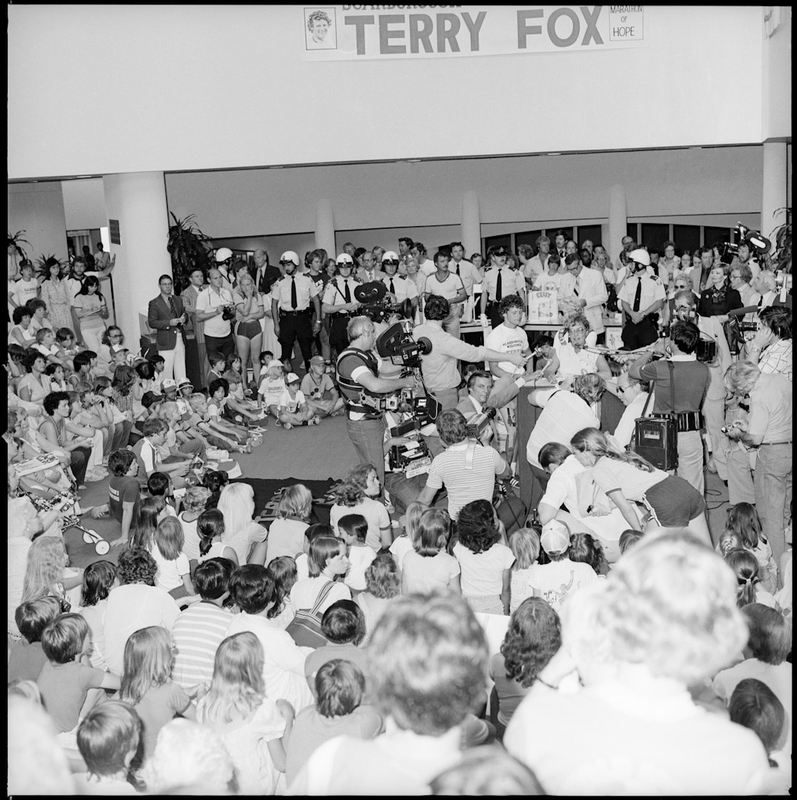 Terry’s legacy has proven itself since his death, and many Canadians consider him to be our national hero. 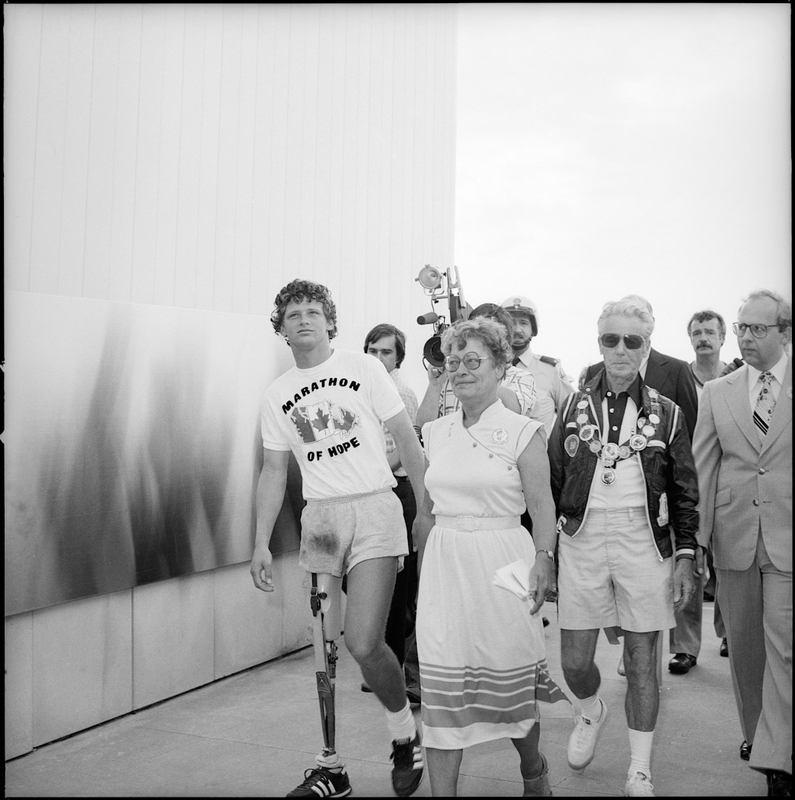 Money raised by the Terry Fox Foundation and their annual Terry Fox Run has exceeded $500 million. This money has assisted many scientists to make important advances in cancer research.